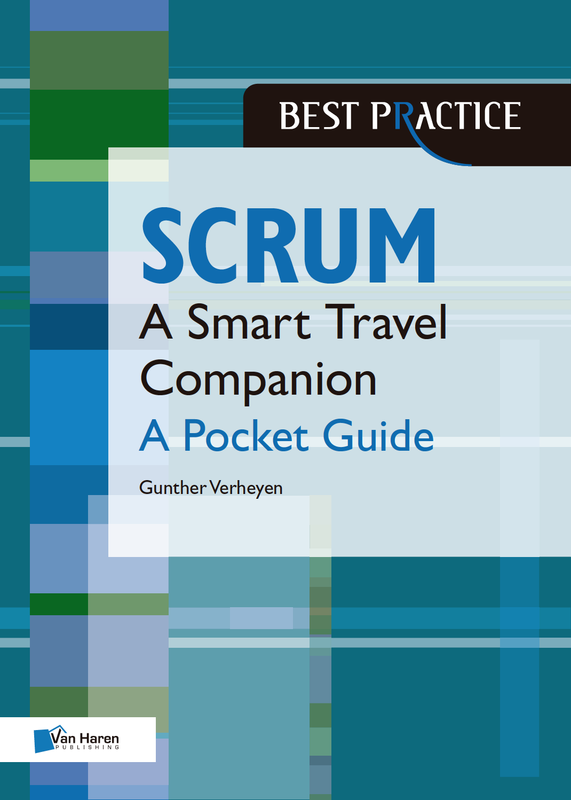 In 2013 I accidentally created a book, “Scrum – A Pocket Guide”. In 2018 I deliberately evolved my Scrum travel companion into a second edition. I am humbled over the many unanticipated consequences of the accidental creation of my pocket guide to Scrum. I equally enjoyed updating my book to a second edition 5 years later. This time around it was a deliberate evolution rather than an accidental creation. The first batch will be available 16 January 2019 and soon after in all major formats (hard copy, Kindle, PDF, eBook, ePub) via all main channels worldwide. Who would have figured that there was room for a second edition of my pocket guide to Scrum? Certainly as my book remained in the best-seller list of my publisher all the time? For this deliberate endeavor, I considered how I described the Scrum Values in the first edition. In July 2016 they were added to the Scrum Guide. How I described the traditional 3 questions as a good, but optional tactic for the Daily Scrum. That too is now in the Scrum Guide, since November 2017. Obviously and fortunately, that does not mean there are no further evolutions to mind. Not only have I found new ways to express Scrum, while working with teams and executives, facilitating various classes, and connecting with practitioners at events. We also adopted terminology that better expresses the intentions of Scrum. Beyond these intrinsic drivers for change, I observe how the balance of society keeps rapidly shifting from industrial (often physical) labor to digital (often virtual) work. In many domains of society, the unpredictability of work increases, drastically and continually. The need for the Agile paradigm is bigger than ever, and thus the value of the tangible framework of Scrum to help people and organizations increase their agility while addressing complex challenges in complex circumstances. More and different people look for guidance and insights on their journey of Scrum, increasingly in domains beyond software development. Organizations look for clear insights in the simple rules of Scrum as their current ways of working fail them in the Complex Novelty space. As the third Scrum wave is rising, the second edition of “Scrum – A Pocket Guide” remains the simple and straightforward compass for those that want to surf that wave. This second edition more than ever offers the foundational insights into Scrum for Complex Novelty players and their organizations to properly shape their Scrum. The definition of Agile is condensed to three key characteristics. Observations are added on the post-chasm years of Agile. The Scrum Game Board is slightly tweaked. The forward-looking design of the Scrum events is expressed more clearly. A Release Burn-down chart as a forecasting tactic is added. The pictures, naming and descriptions of the included scaling tactics are improved. The Scrum Glossary was updated. I thank Blake McMillan (Soulofscrum.com) and Dominik Maximini for their much-appreciated review of this second edition. I thank all translators for their past and on-going efforts to spread my words in different languages. Stay tuned for more news about translations. If I have done a proper job of re-imagining my book, the second edition won’t feel like a new book. A word-by-word comparison would prove otherwise. Contrary to a common assumption, the creation of my book “Scrum – A Pocket Guide” (2013) was anything but a long-lived hope, ambition or dream. As I shared with Joe (Jochen) Krebs on his Agile.FM podcast, it was an accidental and unplanned endeavor. By the end of January 2013 I was not only entering my last period of work at a large consulting company, I was also asked by Dutch publishing house Van Haren to review a manuscript of a book about Scrum. That turned out more difficult than expected. I gave it a few attempts but each time I ended up not finishing the manuscript completely or fluently. I found myself changing and updating the content way too much. And -most of all- I found myself not recognizing and not liking much of what I was reading. I felt bad about it. I felt even worse for being unable to turn my findings into positive, constructive feedback that would be helpful for both the (unknown) author and the publisher. After a few weeks of mentally running around in circles I decided to skip a detailed reading, but go through the manuscript once more and list my biggest findings. At the bottom of the still impressive list, my most important remark to the editor was to not mention my name as a reviewer in case it was decided to move forward with the publication. Soon I received news that the publication was cancelled. It turned out that most reviewers were not too impressed. The publisher shared that they still saw value in a book about Scrum and asked how I envisioned a possible involvement. A quick consultation round within my network, including Ken Schwaber, helped me set aside the doubts whether I could write a book myself and got me into grabbing the opportunity. I was completely unsure of what I was getting myself into, but I felt somewhat comforted by the idea that I had 2 full months to work on it (April-May 2013), the time between ending my work at the consulting company and starting my partnership with Ken at Scrum.org. I additionally found comfort in the fact that I had already published quite some articles and blog notes on Scrum. I assumed that I could easily assemble them into a book. How I was wrong! As soon as I had brought my previous publications together, the real work started, taking much, much more time than I ever could have anticipated. That time went into writing and rewriting, eliminating, simplifying, improving flow and cohesion, stepping back, waiting and getting back to it, aiming at barely enough descriptions to trigger the reader’s imagination. My first working title was “The path of Scrum (A comprehensive travel companion)“. 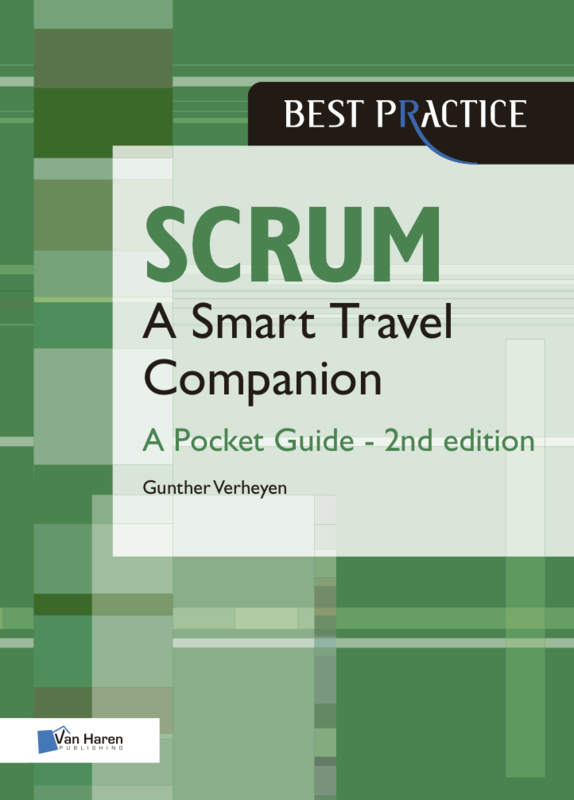 That changed into „Scrum Pocket Guide (A smart travel companion)“ and ended up as “Scrum – A Pocket Guide (A Smart Travel Companion)”. At the heart of my book are the (mandatory) rules of Scrum, from a deep understanding of the purpose of the rules, the main principles underlying Scrum and the Scrum Values. The essential rules are clearly distinguished from (possible) tactics to apply the rules. Some historical perspective to the becoming of Scrum (and Agile) is added, while I end the book reflecting on the future state of Scrum, the challenges that lie ahead of us. I consider “discovery” and “journey” the ultimate key words in the way I wanted to present the Scrum framework. Scrum is the compass that guides people and organizations on their journey of discovery in the land of complex challenges. Adopting and employing Scrum is in itself however also a journey of discovery. 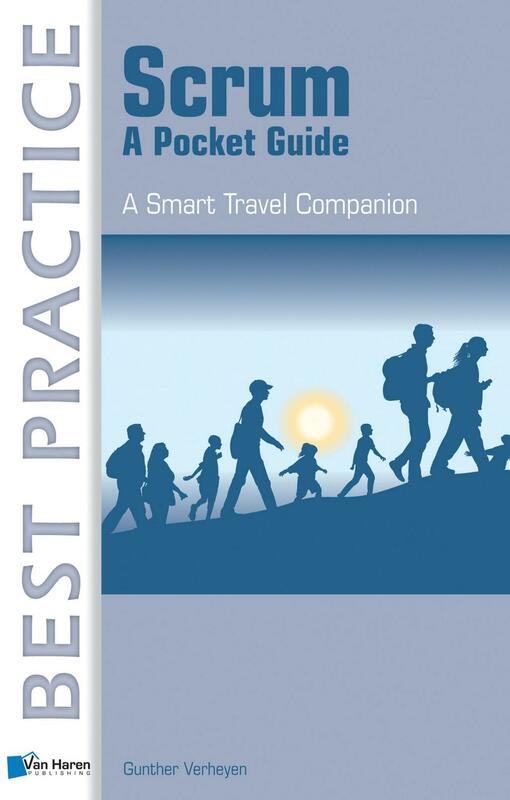 Hence the subtitle of my pocket guide to Scrum, “A Smart Travel Companion,” and the picture on the initial cover. When visiting the Scrum.org office in Burlington-Boston in June 2013 I shared my final manuscript with Ken, and Ken kindly agreed to write a foreword, which he delivered in August (find it below). Finally, in November 2013 I was able to announce that my book was released to the world, and available in all major formats (hard copy, Kindle, PDF, eBook, ePub) and via all main channels worldwide. If you have trouble finding my book, ask Google. 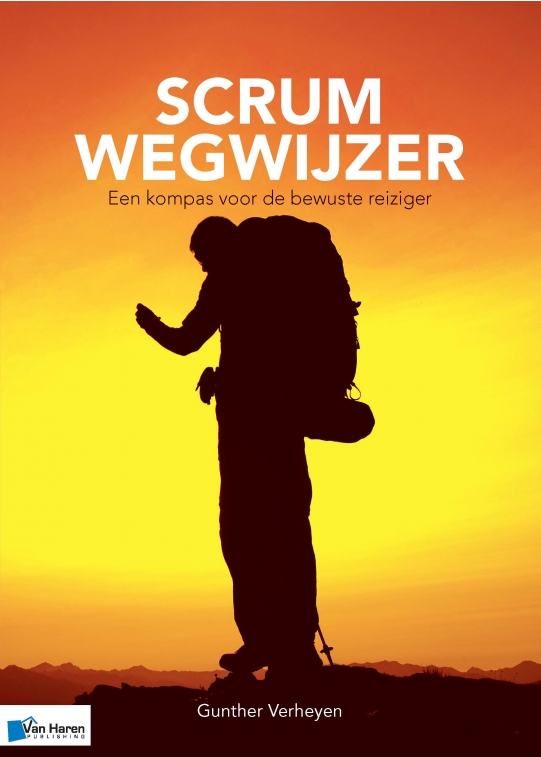 In the spring of 2016 I created a Dutch translation of my book as “Scrum Wegwijzer“. In the fall of 2016, at the occasion of the 4th reprint, the cover of the English version got updated and I recorded a 3-minutes introduction of Scrum. 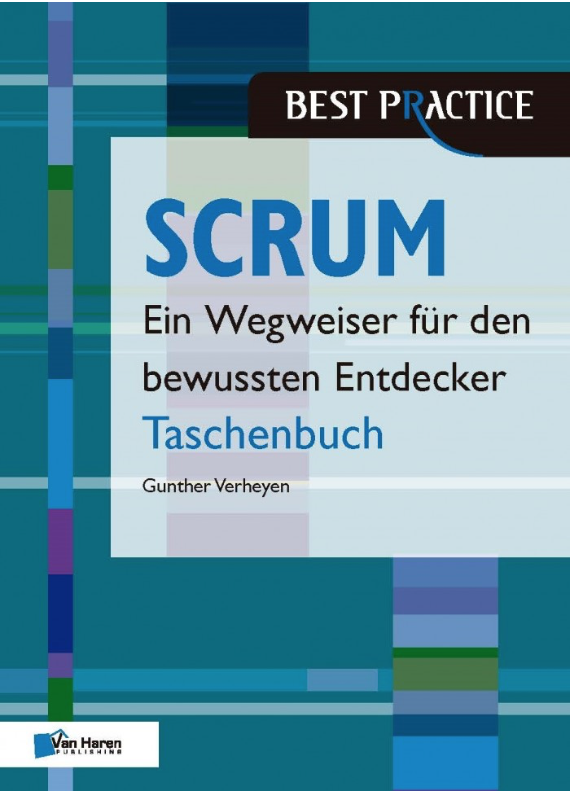 In 2017 (spring) Peter Götz and Uwe Schirmer created a German translation as “Scrum Taschenbuch“. All that time, my book remained in the best-seller list of my publisher, Van Haren ( the Netherlands). In 2018 I have created a second edition of my book. This time around it was a deliberate evolution rather than an accidental creation. In 2018 several people approached me to create translations of my book. Stay tuned for more news. It is quite amazing and humbling that the result of my accidental work in 2013, after 5+ years, is more alive than ever, and that demand is big enough for a deliberate evolution into a second edition of the book. I hope you open up my book again now in a while, to find information that is most valuable to where you are on your journey at that time. An outstanding accomplishment that simmers with intelligence. I have struggled to write this foreword. I feel the foreword should be as well-written as the book it describes. In this case, that is hard. Read Gunther’s book. Read it in part, or read it in whole. You will be satisfied. Scrum is simple, but complete and competent in addressing complex problems. Gunther’s pocket guide is complete and competent in addressing understanding a simple framework for addressing complex problems, Scrum. While developing my book “Scrum – A Pocket Guide” (2013) I described how there is value in the Scrum Values. In 2016 the Scrum Values were added to the Scrum Guide. 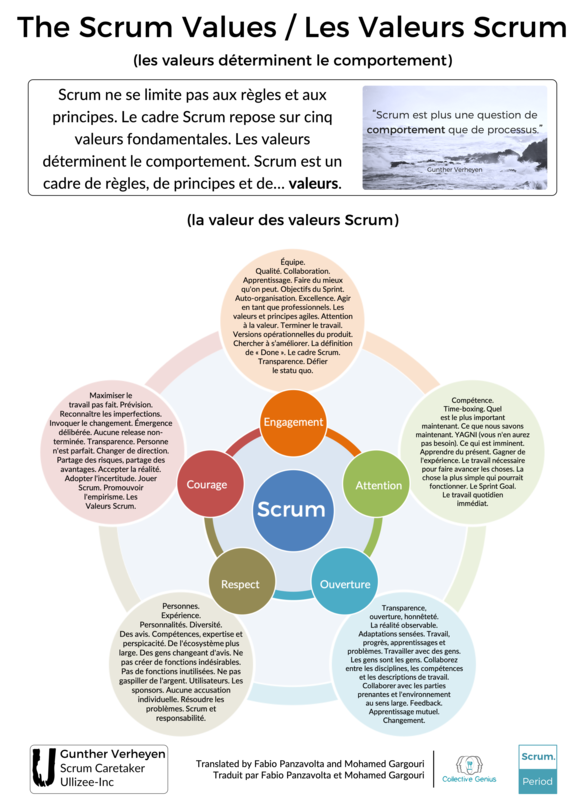 I am gratified that Fabio Panzavolta delivered the work for a poster of the French version of the Scrum Values, available as a free download (PNG): The Scrum Values (French poster). Fabio and Mohamed Gargouri previously created the French translation of the full text for the international Scrum Values PDF (September 2018). Stay tuned for an update of the document by the end of 2018. Scrum est un cadre sur lequel les personnes et les organisations développent un processus de travail qui est spécifique et approprié à leurs époque et contexte. Les règles et les principes de Scrum servent tous l’empirisme, ou processus de contrôle empirique, comme le plus optimal dans le traitement de défis complexes dans des circonstances complexes. Il y a toutefois plus que les règles et principes. Scrum est plus à propos du comportement que du processus. Le cadre Scrum est basé sur cinq valeurs fondamentales. Bien que ces valeurs n’aient pas étés dans la version originale de Scrum et qu’ils ne soient pas exclusifs à Scrum, ils donnent une direction au travail, au comportement et aux actions dans Scrum. Scrum est un cadre de règles, principes et… valeurs. La définition générale d’ ‘engagement’ est « l’acte par lequel on s’engage à accomplir quelque chose, une activité, etc. ». Il peut être illustré par l’entraîneur d’une équipe qui déclare : « je ne pouvais pas blâmer les joueurs pour leur engagement » (bien qu’ils pourraient avoir perdu la partie). Cela décrit exactement comment l’engagement est pensé dans Scrum. L’engagement est au sujet du dévouement et s’applique aux actions et l’intensité de l’effort. Ce n’est pas à propos du résultat final, car cela est souvent incertain et imprévisible pour les défis complexes dans des circonstances complexes. Déjà, il y avait une interprétation erronée, largement répandue, du mot engagement dans le contexte de Scrum. Cela tire son origine principalement de l’ancienne attente du cadre Scrum qui disait que les équipes devraient ‘s’engager’ à un Sprint. A travers le point de vue du paradigme industriel traditionnel, cela a été mal traduit dans une attente que tout le périmètre sélectionné en Sprint Planning serait complété pour la fin du Sprint, à priori. ‘Engagement’ a été mal converti en contrat immuable. Dans le complexe, créatif et hautement imprévisible monde du développement d’un nouveau produit, la promesse d’un périmètre précis contre le temps et le budget n’est pas possible. Trop de variables influençant le résultat sont inconnues ou pourraient se comporter d’une manière imprévisible. Pour mieux refléter l’intention originale et connecter plus efficacement à l’empirisme, ‘l’engagement’ dans le contexte du périmètre pour un Sprint a été remplacé par ‘prévision’. Les joueurs s’engagent avec l’équipe. Ils s’engagent à la qualité. Ils s’engagent à collaborer. Ils s’engagent à apprendre. Ils s’engagent à faire de leur mieux, tous les jours de nouveau. Ils s’engagent au Sprint Goal. Ils s’engagent à agir en professionnels. Ils s’engagent à s’auto-organiser. Ils s’engagent à l’excellence. Ils s’engagent aux valeurs et principes Agile. Ils s’engagent à créer des versions du produit qui fonctionnent. Ils s’engagent à trouver des améliorations. Ils s’engagent à la définition de Done. Ils s’engagent au cadre Scrum. Ils s’engagent à se concentrer sur la valeur. Ils s’engagent à terminer le travail. Ils s’engagent à inspecter et adapter. Ils s’engagent à la transparence. Ils s’engagent à challenger le statu quo. Les responsabilités équilibrées mais distinctes de Scrum permettent à tous les joueurs de se concentrer sur leur expertise. Le time-boxing de Scrum encourage les joueurs à faire attention à ce qui est le plus important maintenant sans être dérangés par des considérations sur ce qui pourrait avoir une chance de devenir important à un moment donné dans le futur. Ils se concentrent sur ce qu’ils connaissent maintenant. YAGNI (‘You Ain’t Gonna Need It’ / vous n’en aurez pas besoin), c’est un principe d’eXtreme Programming, il aide à retenir cette attention. Les joueurs se concentrent sur ce qui est imminent comme le futur est très incertain et ils veulent apprendre du présent afin de gagner de l’expérience pour le travail futur. Ils font attention au travail nécessaire pour avoir des éléments finis. Ils font attention à la chose la plus simple qui pourrait fonctionner. Le Sprint Goal fourni l’attention pour une période de 4 semaines, ou moins. Au cours de cette période, le Daily Scrum aide les personnes à se concentrer ensemble sur le travail quotidien immédiatement nécessaire pour obtenir le meilleur progrès possible vers le Sprint Goal. L’empirisme de Scrum nécessite transparence, ouverture et honnêteté. Les joueurs-inspecteurs voudront vérifier la situation actuelle pour effectuer des adaptations raisonnées. Les joueurs sont ouverts concernant leur travail, avancement, apprentissages et problèmes. Mais, ils sont aussi ouvert pour les personnes, et travaillent en collaboration avec les personnes; reconnaissent les personnes comme des personnes, et non des “ressources”, robots, rouages, ou des pièces de machine remplaçables. Les joueurs sont ouverts à collaborer dans toutes les disciplines, compétences et profils de poste. Ils sont ouverts pour collaborer avec les parties prenantes et le plus large environnement. Ouverts à partager les retours d’expérience et apprendre l’un de l’autre. Ils sont ouverts aux changements parce que l’organisation et le monde dans lequel ils opèrent changent de façon imprévisible et constamment. Le vaste écosystème de Scrum prospère dans le respect des personnes, leurs expériences et leur passé personnel. Les joueurs respectent la diversité. Ils respectent les différentes opinions. Il respectent les uns les autres compétences, expertise et idées. Ils respectent le plus large environnement en ne se comportant pas comme une entité isolée du monde. Ils respectent le fait que les clients changent d’avis. Ils montrent du respect aux sponsors en ne construisant pas ou gardant des fonctionnalités qui ne sont jamais utilisées et qui augmentent le coût du produit. Ils montrent du respect en ne gaspillant pas l’argent dans des choses non valorisantes, non appréciables, non implémentables ou utilisables quoi qu’il en soit. Ils montrent du respect pour les utilisateurs en corrigeant leurs problèmes. 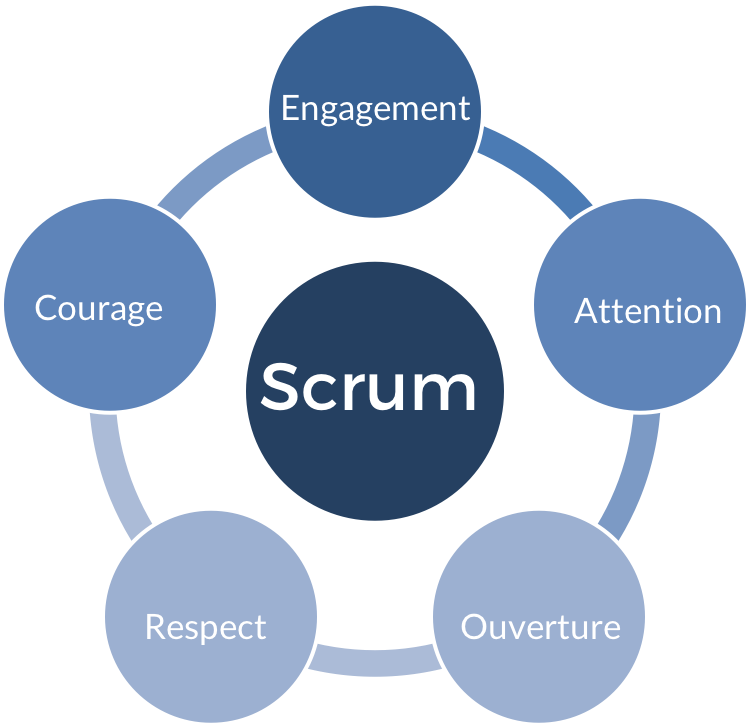 Tous les joueurs respectent le framework Scrum. Ils respectent les responsabilités de Scrum. Les joueurs montrent du courage en ne construisant pas des choses que personne ne voudra. Courage en admettant que les spécifications ne seront jamais parfaites et qu’aucun plan ne peut saisir la réalité et la complexité. Ils montrent du courage pour considérer le changement comme source d’inspiration et d’innovation. Courage de ne pas livrer des versions incomplètes du produit. Courage en partageant toutes les informations possibles qui pourraient aider l’équipe et l’organisation. Courage en admettant que personne n’est parfait. Courage de changer de direction. Courage de partager les risques et bénéfices. Courage de laisser tomber les certitudes trompeuses du passé. Les joueurs montrent du courage en promouvant Scrum et l’empirisme pour faire face à la complexité. Ils montrent du courage pour soutenir les valeurs de Scrum. Le courage de prendre une décision, oeuvrer et progresser. Et encore plus, du courage pour changer cette décision. 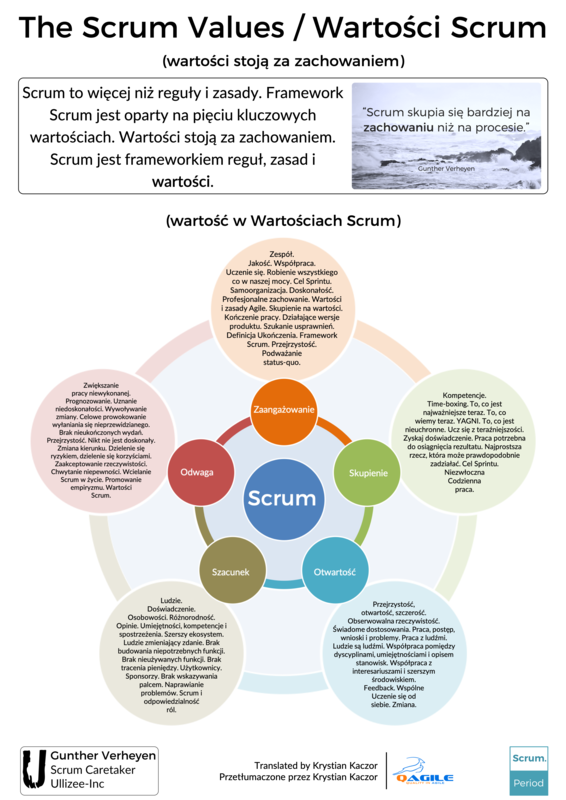 I am gratified that Krystian Kaczor delivered the work for a poster of the Polish version of the Scrum Values, available as a free download (PNG): The Scrum Values (Polish poster). Krystian previously created the Polish translation of the full text for the international Scrum Values PDF (September 2018). Stay tuned for an update of the document by the end of 2018. Scrum jest frameworkiem, na którym ludzie i organizacje rozwijają proces pracy, który jest specyficzny oraz odpowiedni do ich czasu i kontekstu. Wszystkie reguły i zasady Scrum służą empiryzmowi, albo inaczej empirycznej kontroli procesu, który jest najbardziej optymalnym sposobem radzenia sobie ze złożonymi wyzwaniami w złożonych okolicznościach. Jednak jest coś więcej niż te reguły i zasady. Scrum skupia się bardziej na zachowaniu niż na procesie. Framework Scrum jest oparty na pięciu kluczowych wartościach. Chociaż te wartości nie są wynalezione jako część Scruma, ani nie są unikalne dla Scruma, nadają one kierunek pracy, zachowaniom i czynnościom w Scrum. Scrum jest frameworkiem reguł, zasad i … wartości. Ogólna definicja “zaangażowania” to “stan lub cecha bycia oddanym sprawie, aktywności, itd. .” Można to zilustrować stwierdzeniem trenera zespołu “Nie mógłby zarzucić moim graczom braku zaangażowania” (chociaż mogli właśnie przegrać mecz). To dokładnie opisuje jak zaangażowanie jest rozumiane w Scrumie. Zaangażowanie dotyczy akcji i intensywności wysiłku. Nie dotyczy ostatecznego rezultatu, ponieważ ten jest zwykle niepewny i nieprzewidywalny dla złożonych wyzwań w złożonych okolicznościach. Jednak mylne zrozumienie słowa zaangażowanie było szeroko rozpowszechnione w kontekście Scruma.. Wzięło się to z dawnego oczekiwania frameworku Scrum, który mówił, że zespoły powinny “zobowiązać się” do Sprintu. Także w języku polskim słowo “commitment” ma dwa tłumaczenia, zaangażowanie i zobowiązanie. [przyp. tłum.] Przez pryzmat tradycyjnego, przemysłowego paradygmatu było to błędnie tłumaczone jako oczekiwanie, że cały zakres wybrany na Planowaniu Sprintu będzie bezwzględnie ukończony do końca Sprintu. “Zaangażowanie” zostało błędnie zamienione na twardy kontrakt. W złożonym, kreatywnym i wysoce nieprzewidywalnym świecie wytwarzania nowych produktów obiecywanie dokładnego zakresu w czasie i budżecie jest niemożliwe. Zbyt wiele zmiennych wpływających na rezultat jest nieznane lub może zachowywać się w nieprzewidywalne sposoby. Żeby lepiej odzwierciedlić oryginalne zamierzenie i bardziej efektywnie połączyć z empiryzmem, słowo “commitment” w kontekście zakresu dla Sprintu zostało zamienione na słowo “forecast”, czyli prognoza. Gracze angażują się w zespół. Angażują się w jakość. Angażują się we współpracę. Angażują się w uczenie się. Angażują się w robienie co mogą każdego dnia na nowo. Angażują się w Cel Sprintu. Angażują się w działanie jak profesjonaliści. Angażują się w samo-organizację. Angażują się w doskonałość.. Angażują się w wartości i zasady Agile. Angażują się w tworzenie działających wersji produktu. Angażują się w szukanie ulepszeń. Angażują się w Definicję Ukończenia (Definition of Done). Angażują się we framework Scrum. Angażują się w skupienie na wartości. Angażują się w kończenie pracy. Angażują się w sprawdzanie i dostosowywanie. Angażują się w przejrzystość. Angażują się w podważanie status quo. Zbalansowane a zarazem wyraźne odpowiedzialności w Scrum umożliwiają wszystkim graczom skupić się na ich kompetencjach. Ramy czasowe Scruma (time-boxing) Scruma zachęca graczy do skupienia się na tym, co jest najważniejsze teraz bez przejmowania się rozważaniami na temat co mogłoby stać się ważne kiedyś w przyszłości. Skupiają się na tym, co teraz wiedzą. YAGNI (‘You Ain’t Gonna Need It’), czyli Nie Będziesz Tego Potrzebował, to zasada z Programowania Ekstremalnego (eXtreme Programming), która pozwala utrzymać skupienie. Gracze skupiają się na tym co jest najbliższe, gdyż przyszłość jest wysoce niepewna i chcą uczyć się z teraźniejszości, żeby zyskać doświadczenie do dalszej pracy. Skupiają się na pracy potrzebnej do ukończenia rzeczy. Skupiają się na najprostszej rzeczy, która prawdopodobnie może zadziałać. Cel Sprintu daje skupienie na okres 4 tygodni lub mniej. W ramach tego okresu, Codzienny Scrum pomaga ludziom wspólnie skupić się na niezwłoczne,j codziennej pracy potrzebnej, żeby umożliwić postęp w kierunku Celu Sprintu. Empiryzm Scrum wymaga przejrzystości, otwartości i uczciwości. Gracze, którzy dokonują sprawdzania, chcą ocenić aktualną sytuację w celu dokonania sensownych dostosowań. Gracze są otwarci na temat swojej pracy, tego czego się nauczyli i problemów, które napotkali. Oprócz tego, są też otwarci na ludzi, pracę z ludźmi i zauważenie, że ludzie to ludzie, a nie “zasoby”, roboty, tryby czy zamienne części maszynerii. Gracze są otwarci, żeby współpracować wskroś dziedzin, umiejętności i opisów stanowisk pracy. Są otwarci, żeby współpracować z interesariuszami i szerszym środowiskiem. Otwarci w dzieleniu się informacją zwrotną i uczeniu się od siebie. Są otwarci na zmianę, kiedy organizacja i świat, w których działają zmieniają się; nieprzewidywalnie, niespodziewanie i stale. Szerszy ekosystem rozwija się dobrze na gruncie szacunku dla ludzi, ich doświadczenia i osobistej przeszłości. Gracze szanują różnorodność. Szanują inne opinie. Szanują nawzajem swoje umiejętności, kompetencje i spostrzeżenia. Szanują szersze środowisko przez to, że nie zachowują się jak odcięta od świata jednostka. Szanują fakt, że klienci zmieniają zdanie. Okazują szacunek sponsorom przez to, że nie budują ani nie utrzymują funkcji, które nie są nigdy używane albo takich, które zwiększają koszt produktu. Okazują szacunek przez to, że nie tracą pieniędzy na rzeczy, które nie są wartościowe, nie są docenione albo i tak mogą nigdy nie zostać zaimplementowane ani użyte. Okazują szacunek użytkownikom przez naprawianie ich problemów. Wszyscy gracze szanują framework Scrum. Szanują odpowiedzialność w ramach Scruma. Gracze okazują odwagę przez to, że nie budują rzeczy, których nikt nie chce. Odwagę w przyznaniu, że wymagania nigdy nie będą doskonałe i że żaden plan nie może uchwycić rzeczywistości i złożoności. Okazują odwagę, żeby rozważyć zmianę jako źródło inspiracji i innowacji. Odwagę, żeby nie dostarczać nie-ukończonych wersji produktu. Odwagę w dzieleniu się całą możliwą informacją, która może pomóc zespołowi i organizacji. Odwagę w przyznawaniu, że nikt nie jest doskonały. Odwagę, żeby zmienić kierunek. Odwagę, żeby dzielić się ryzykiem i korzyściami. Odwagę, żeby odpuścić <fałszywe> pewniki z przeszłości. Gracze okazują odwagę w promowaniu Scruma i empiryzmu do radzenia sobie ze złożonością. Okazują odwagę do wspierania Wartości Scrum. Odwagę, żeby podjąć decyzję, działać i robić postępy, zamiast stać w martwym punkcie. Nawet więcej odwagi, żeby zmienić tą decyzję. Early in 2018, a translation initiative of the Scrum Glossary took off. It is amazing that there are currently 20 languages in the works. A new release is envisioned before the end of 2018. No deadlines though, no stress. 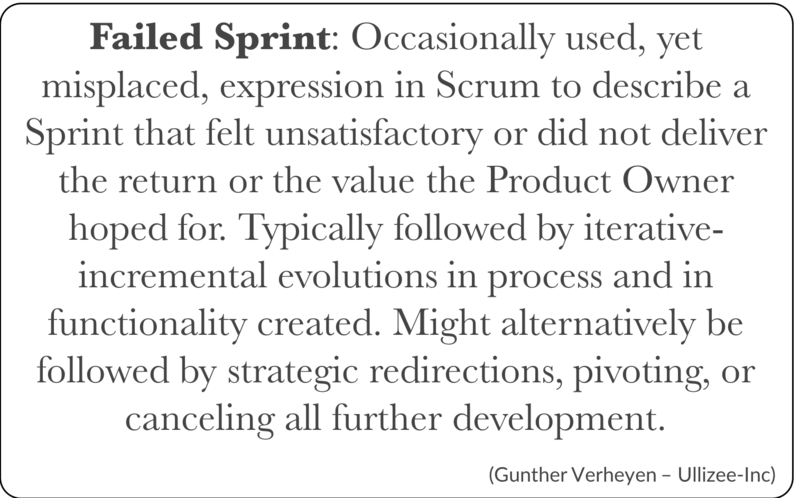 “Failed Sprint” is not part of the glossary, although a definition might still be helpful. In 2010, the principal co-creators of Scrum, Jeff Sutherland and Ken Schwaber, agreed on the first version of the Scrum Guide, thereby creating the official BOK (body of knowledge) for Scrum. A few small, functional updates have been released since then. 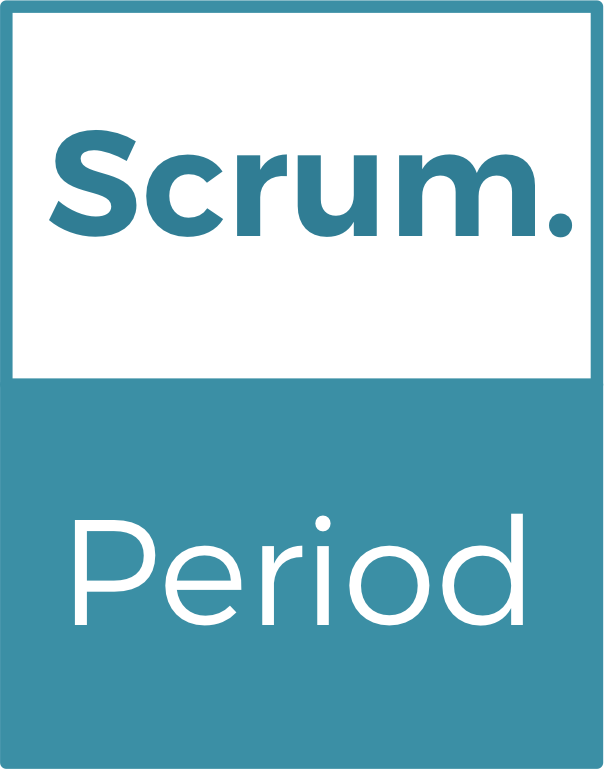 There have been no drastic changes to the core definition of Scrum. The updates are attempts to reduce complexity or have clearer terminology. Language and words do matter. I imagine the difficulty of every rephrasing involved in updating the Scrum Guide. The Scrum Guide holds the single definition of Scrum for countless practitioners across the world, all employing Scrum in unique environments and varying situations. I imagine the discipline of updating the Scrum Guide knowing that many people will not read it. Most of all, I imagine the difficulty of updating the Scrum Guide knowing that many will micro-dissect the texts to identify the tiniest of changes. Many over-think individual words upon the misassumption of traps, tricks and hidden messages. Many still look for methodological exactness and universal precision. Regardless, the fact that Scrum has a clear and documented definition is priceless. The Scrum Guide provides clarity and purpose, albeit not the perfect precision that many seem to look for. Scrum is a tool. Useless unless employed. The Scrum Guide intentionally has no universally applicable, detailed instructions or tactics that in the end only work in specific circumstances. The Scrum Guide describes how the tool works, the rules and roles that apply, the behaviors that make the tool work; not the tactics to apply the rules. 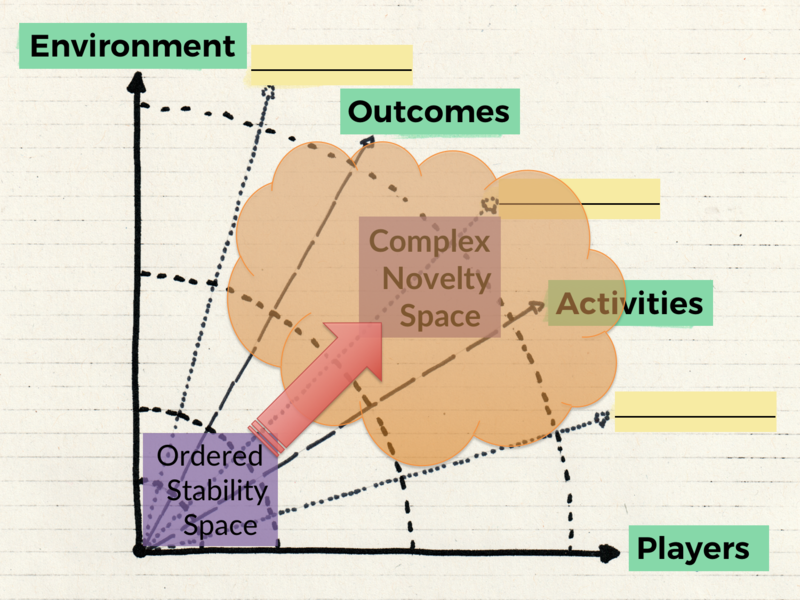 Scrum, by design, offers room and breathing space, inviting people to conceive an approach specific to their context upon the empirical foundation of Scrum. Scrum is a framework, not a traditional (IT) methodology. The Scrum Guide describes the framework, the minimal boundaries within which people deal with complex challenges and create complex solutions in complex circumstances. All exact decisions within those boundaries depend on people, tools, technology, business domain, organizational environment, market situation, and many other aspects. What is the availability of people? Their skills, experience? How well do teams gel? Do they work remotely, or co-located? How long have they been working together? How much multi-tasking does a team or team members have to do? How well are teams facilitated by the environment? What technology is being used? Which version? What dependencies are at play? What development practices does a team have in place? What tools and infrastructure are at the teams’ disposal? How long are the Sprints? How is the connection with product management? What is the competition doing? Scrum does not have the false pretence nor ambition to offer universal truths, universal answers that apply in every single situation. 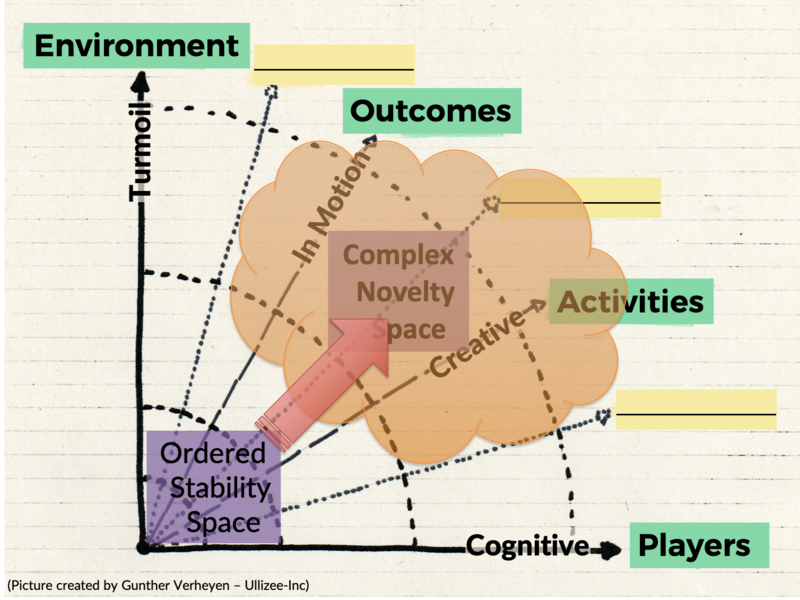 Scrum essentially invites people to regularly match the actual state of their work against reality, in order to optimize flow and progress, while re-aligning and adapting to new circumstances, highly disruptive events and new insights. Scrum is a simple framework for complex product delivery. The Scrum framework offers the simplicity needed to address complex challenges, without being simplistic about the unique and specific problems that teams and organizations face. Many people struggle with this deliberate imprecision when they try to improve their understanding of Scrum. They look for detailed instructions. They ask universal questions and demand exact and precise answers. How long should Sprint Planning be? And the other events? How much time does the Product Owner role take? Is the Scrum Master role a full-time job? Should a team be available full-time? How must we organize when the team is distributed? How much time of a Sprint should a team spend on testing? How many business analysts are needed in the team? How should we calculate utilization? How can we measure productivity? Should the Product Owner and the Scrum Master understand the technology? What if… ? No document, no matter its length, can provide exact answers to all of these questions for all Scrum practitioners of all workplaces around the world. It requires skilled professionals (Scrum Masters, trainers, and otherwise) to build on the language and words provided by the Scrum Guide and explain intent and purpose. It requires courageous professionals to help teams, organizations, and students grow an understanding of how Scrum supports them in empirically dealing with the diverse, complex challenges they face in their real-life complexity. Such professionals understand that what works today might not work tomorrow. Exact instructions lead people astray, undermine their ability to think autonomously in terms of Scrum. It is highly disrespectful. Answers to the ‘what if’ questions will emerge from the use of Scrum, from the inspections performed in Scrum. Be prepared to learn and adapt. My personal stance, as a trainer, a friend, a trusted advisor, a whatever in Scrum, is to facilitate people in understanding the purpose of the rules and the roles of Scrum. This is at the heart of my book, Scrum – A Pocket Guide, and all my actions of promoting and explaining Scrum. The only viable way forward for people is to devise their own solutions employing Scrum. No external instance, expert or otherwise, can or should do that for them. It may be tempting. It is certainly highly convenient. It might make a person appear knowledgeable. But it promises certainty where there isn’t. That is unprofessional. It ignores context and complexity. It ignores people’s intelligence and creativity. Every case of Scrum is unique. There is no copy-paste. There are no universal truths in the complex novelty space. The definition of Scrum requires no methodological precision. There is no future in ignoring complexity. I am no ‘expert’ providing universal solutions. Consider me an eternal novice instead. While developing my book “Scrum – A Pocket Guide” (2013) I described how there is value in the Scrum Values. In 2016 the Scrum Values were added to the Scrum Guide. In 2018 some global Scrum enthusiasts translated my description into several languages. 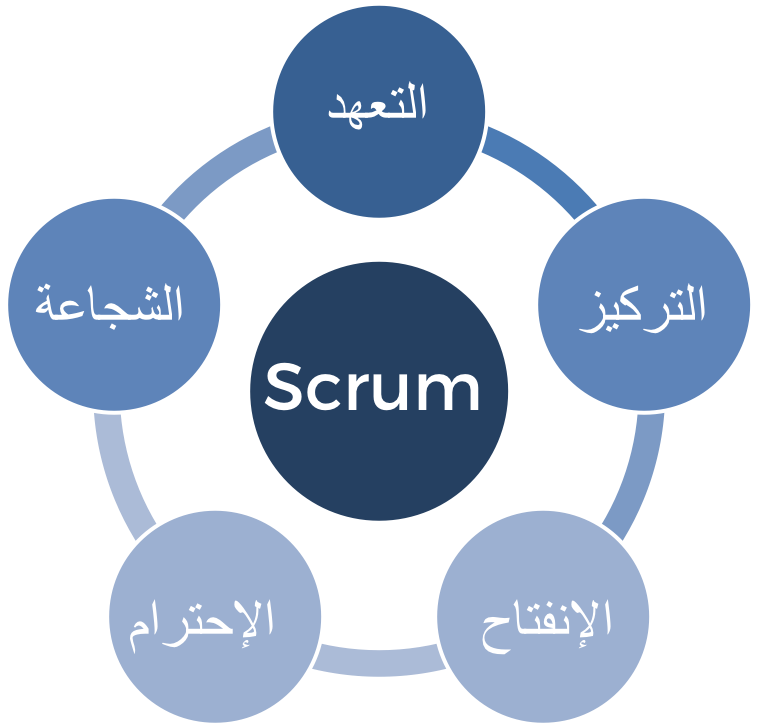 I am gratified for sharing that Rasheed Raya (Syria/Netherlands) created an Arabic version of the Scrum Values. Find Rasheed’s full text below. 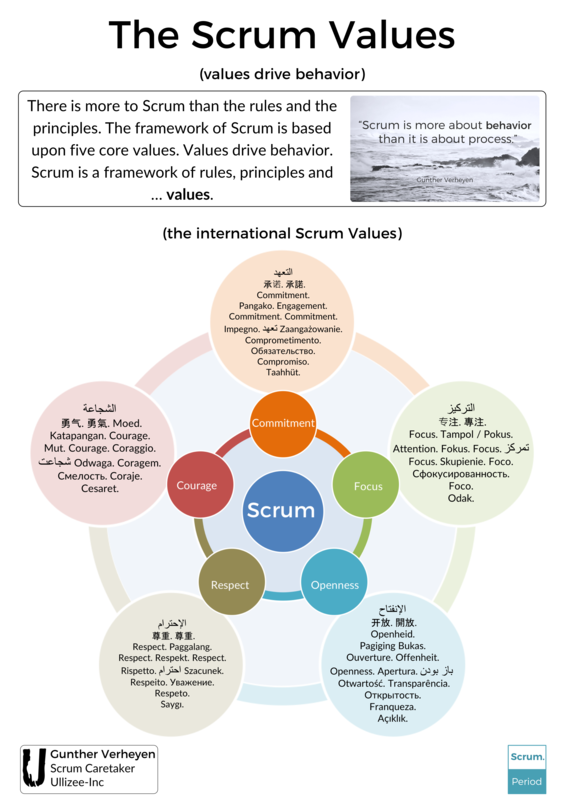 It has been added to the September 2018 edition of the international Scrum Values. السكروم هو عبارة عن نظام من خلاله يمكن للأشخاص والمنظمات تطوير طرق عمل محددة ومناسبة لوقتهم وحالتهم. إن قواعد ومبادئ السكروم جميعها تخدم المبدأ التجريبي أو طرق عمل تجريبية للتحكم, كأفضل مثال للتعامل مع الحالات المعقدة أو المركبة. على أي حال يوجد ماهو أكثر من القواعد والمبادئ للسكروم. إن السكروم هو عبارة عن سلوكيات أكثر منه طرق عمل. إن نظام سكروم قائم على خمس قيم أساسية. بالرغم من أن هذه القيم لم يتم إيجادها من أجل السكروم وهي ليست مخصصة للسكروم, القيم توفر مسار للعمل, السلوكيات والأفعال المتعلقة بالسكروم. السكروم هو نظام عمل مؤلف من قواعد, مبادئ و … قيم. إن التعريف العام للتعهد أو الإلتزام هو “الحالة أو الصفة لشخص عندما يكون مخصص لعمل ما, أو نشاط معين, الخ…” على سبيل المثال مدرب فريق يقول “لايمكنني لوم لاعبي فريقي لإنهم كانوا ملتزمين” (بالرغم من أنهم خسروا المباراة). هذا يصف تماما كيف يتم تعريف الإلتزام في السكروم. الإلتزام هو عبارة عن الجهود وتخصيص الوقت والخبرات للوفاء بالتعهدات. ولكن الإلتزام غير مرتبط بالنتيجة النهائية للعمل, لأنه بالأساس لايمكن معرفة النتيجة النهائية لعمل معقد غير متوقع النتائج. حتى الان, كان هناك فهم خاطئ لمعنى قيمة الإلتزام في نظام السكروم. وهذا يعود أساساً للتوقعات السابقة بأن نظام عمل سكروم يعني أن فريق العمل يجب أن “يلتزم” بالسبرنت. هذا أيضا أدى الى ترجمة خاطئة بأن جميع الأنشطة الموجودة في السبرنت يجب أن تنتهي وتنفذ عند نهاية السبرنت, بغض النظرعن أي شيء. الإلتزام ترجم بشكل خاطئ الى مايشبه الإتفاقية الموقعة. في العالم الذي يكون فيه المنتج المراد تطويره معقد, إبداعي و لا يمكن التنبأ بنتائجه مسبقاً, عندها يكون تحديد وقت وميزانية أمر غير ممكن. الكثير من العوامل الخارجية وتأثيرها تكون غير معروفة مسبقاً أو من الممكن أن تكون هناك أفعال غير متوقعة. ومن أجل ربط ماتعنيه قيمة الإلتزام بشكل أساسي وفعال بالمبدأ التجريبي التي يقوم عليها نظام السكروم, فإنه تم إستبدال كلمة “الإلتزام” ب “التنبئ” خلال السبرنت. ورغم كل شيء, يبقى الإلتزام قيمة رئيسية ضمن السكروم. اللاعبون يلتزمون بالفريق. يلتزمون بالجودة. يلتزمون بالتعاون. يلتزمون بفعل أفضل مايمكنهم, كل يوم بشكل متكرر. يلتزمون بهدف السبرنت. يلتزمون بالتعامل بإحترافية. يلتزمون بتنظيم أنفسهم ذاتياً. يلتزمون بالتفوق. يلتزمون بقيم ومبادئ المرونة. يلتزمون بصنع إصدارات منتج تعمل بشكل جيد. يلتزمون بالبحث عن أساليب للتطور والتحسن. يلتزمون بالتعريف الصحيح للعمل المنجز. يلتزمون بنظام عمل السكروم. يلتزمون بالتركيز على القيمة. يلتزمون بإنهاء العمل. يلتزمون بالبحث والتكيف. يلتزمون بالشفافية. يلتزمون بتحدي الوضع الراهن. التوازن والتوزيع المستقل للمسوؤليات في السكروم يُمكِن جميع اللاعبين من التركيزعلى خبراتهم. إن الوقت المحدد المتضمن في نظام السكروم يُشجع اللاعبين على التركيز على الأشياء الأكثر أهمية حالياً دون التفكير أو الإنشغال بالنظر الى الأمور التي من الممكن أن تكون مهمة في المستقبل. هم يُركزون على الأشياء المعروفة لديهم حالياً. اللاعبون يُركزون على الأشياء قريبة الحدوث وبما أنه يصعُب التنبئ بالمستقبل فهم بحاجة للتعلم من الحاضر بغرض تحصيل خبرات قد تساهم بأي عمل مستقبلي. هم يركزون على مايُساهم في إنجاز العمل المطلوب. هم يركزون على أبسط شيء والذي من الممكن أن يساهم بإنجاز العمل. إن الهدف المحدد للسبرنت يعطي تركيز لمدة أربع أسابيع, أو أقل. خلال هذه الفترة, إن إجتماع السكروم اليومي يساعد الأشخاص على التعاون من أجل التركيز على العمل اليومي المطلوب لتحقيق أفضل تقدم ممكن لتحقيق هدف السبرنت. المبدأ التجريبي للسكروم يتطلب شفافية, إنفتاح وأمانة. مفتش العمل يريد التحقق من الوضع الراهن من أجل إيجاد فرص للتأقلم. اللاعبون يُشاركون بإنفتاح مالذي يقومون به, التقدم بالعمل, التعلم والمشاكل التي قد يواجهوها. هم أيضاً منفتحون على العمل مع الأخرين,والإعتراف بأن الأشخاص هم أشخاص وليسوا موارد, روبوتات, أشياء ثانوية أو قطع غيار. اللاعبون منفتحون للتعاون من خلال الأخلاقيات, الحرف والوصف التوظيفي للعمل. هم منفتحون للتعاون مع أصحاب المصلحة والمحيط الواسع. هم منفتحون لتلقي وإعطاء نصائح وأيضاً للتعلم من بعضهم البعض. هم منفتحون على التغيير بما إن المنظمة والعالم حولهم أيضاً يتغير بشكل لايمكن توقعه أو التنبئ به, بشكل مفاجئ وبإستمرار. إن النظام البيئي الموسع للسكروم يزدهر بفضل إحترام الأشخاص لبعضهم البعض, لخبراتهم وخلفياتهم الشخصية. اللاعبون يحترمون التنوع. يحترمون وجهات النظر المختلفة. يحترمون ميزات, خبرات وأراء بعضهم البعض. هم يحترمون البيئة المحيطة بحيث لايتصرفون وكأنهم في عالم معزول. هم يحترمون حقيقة أن الزبائن يغيرون أرائهم. هم يظهرون إحترام للممولين بحيث لايقومون ببناء او الإحتفاظ بمهام لم تستخدم أبداً والتي ترفع تكلفة المنتج. هم يظهرون الإحترام من خلال عدم إهدارهم للأموال على أشياء غير قيمة, غير نافعة ويمكن أن لاتستخدم أبداً. هم يظهرون إحتراماً للمستخدمين من خلال إصلاح وحل مشكلاتهم. جميع اللاعبين يحترمون نظام عمل سكروم. ويحترمون المسؤوليات المحددة في السكروم. اللاعبون يظهرون شجاعة من خلال عدم صنعهم لمنتجات لايريدها أحد. الشجاعة من خلال إعترافهم بأن متطلبات العمل لن تكون كاملة أبداً وأنه لايوجد خطة عمل يمكنها أن تغطي الواقع والتعقيد. هم يظهرون شجاعة من خلال إعتبارهم بأن التغيير هو مصدر الإلهام والإبتكار. شجاعة بعدم تسليم منتج غير منتهي بعد. شجاعة من خلال مشاركة جميع المعلومات الممكنة والتي قد تساعد فريق العمل والمنظمة. الشجاعة من خلال الإعتراف بأن لايمكن لأحد أن يكون كاملاً. شجاعة لتغيير المسار عند الحاجة. شجاعة بمشاركة المخاطر والمنافع. اللاعبون يظهرون شجاعة من خلال تعزيز السكروم والمبدأ التجريبي للتعامل مع تعقيدات العمل. هم يظهرون شجاعة من خلال دعمهم لقيم السكروم. الشجاعة في إتخاذ قرار, العمل وتحقيق تقدم, عدم التظلم و شجاعة أكثر لتغيير هذا القرار.